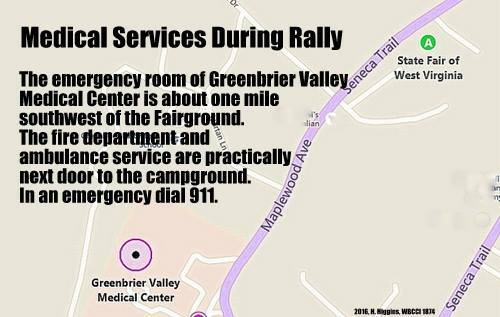 There is an emergency department at Greenbrier Valley Medical Center on Seneca Trail, about one mile southwest of the Fairground. The address is 202 Maplewood Ave., Ronceverte, WV. MedExpress Urgent Care at 1560 Jefferson St. North, Lewisburg, WV is a walk-in clinic open 8 a.m. to 8 p.m. 7-days a week. It is about 3 miles northeast of the Fairground. The Lewisburg Fire Department and ambulance service are practically next door to the Fairground. Know your location in the campground. In an emergency: Dial 911; turn on your vehicle headlights and emergency blinkers to help first responders find you; and, ask your neighbors to help get the emergency vehicles to your campsite. There are several local pharmacies in the Lewisburg area. They include the chains where you might have your prescriptions registered, such as Walmart, CVS, Kmart, Rite Aid and Kroger.